This morning our Princess was the one who took Miss Sophie out for her morning constitutional. I heard the door open and close, and then immediately open again. “Mama! Mama! You have to come here!” she said urgently. I really don’t like it when they do that. It could be anything from a flower growing in a flowerpot (yay!) to a bleeding injury (boo! ), and since I have no idea, Anxiety Girl always leaps in to jump to conclusions, and my stomach turns inside out. “What is it?” I called out, making my way to the front door with a sense or purpose. We live at the edge of a wooded area. That something dead could have been ANYTHING from raccoon to fox to cat to dog to mouse to mole to chipmunk to frog to snake to worm. Considering the source, any one of those would have caused her to raise her voice as she did. “What is it?” I asked, peering out into the yard. I walked outside, and there it lay on the grass. Definitely dead. Cardinals are my favorite birds. I can remember one flying across the bottom on my way to work many years ago, every single morning. I felt like it was a good omen for my day, and I made up in my head that it was good luck to see a cardinal. When Daddy was diagnosed with the Giant four years ago, I would see one at Blackberry Flats from time to time. One day when things were particularly hard and discouraging, I went in and sat with Daddy, next to his hospital bed in the living room. He was gazing out his window, the same one his recliner used to sit next to. Out of the corner of my eye I saw a flash of red. “Daddy! It’s a cardinal. That’s good luck. It’s a good sign.” He gave a half-smile. And watched. I gave Mama a cardinal Christmas ornament that year, and she kept it hanging from her lamp year round. We love those beautiful birds. And now. Today. Poor thing. My heart broke. Of all weeks. In the midst of emotions and memories and trying to wrap my brain around the idea that it has been almost two years since I last heard my Daddy’s voice and held his hand and looked in those eyes. A precious, beautiful cardinal. Dead. Sadness. Just this. That sweet little bird, once so alive and flying high above it all–now, just gone. No more. It left me with a heavy heart. I wanted to sit and cry and let this bird’s life not to have been for naught. But as always happens, perhaps for the better, life intervened. My zoo crew and my zoo all needed feeding and tending to. I turned away, and wiped away the tears I was crying on the inside. Time for that would come later. Tonight as I thought about the cardinal and how he spoke to my grief, laying there lifeless and still beautiful, I found this quote from a poem. Yes, another Mary Oliver poem. She speaks to me lately, and I give thanks for her. I too long for these things she describes. I remember sitting on the couch in the living room of the little house on my Granny’s farm on a cold Sunday afternoon in winter, listening to my Daddy and Granny talk about the birds that had been around. When I feel small and lonely and miss those that have gone before I go back in time to that couch, listening, feeling small and safe and warm as the little heater worked to warm the room and the whole house. And as they talked I gazed out the big plate-glass window, hoping to catch a glimpse of the birds they were speaking of. I wanted to be able to talk about them too. To belong. And be with. The same things I want now. 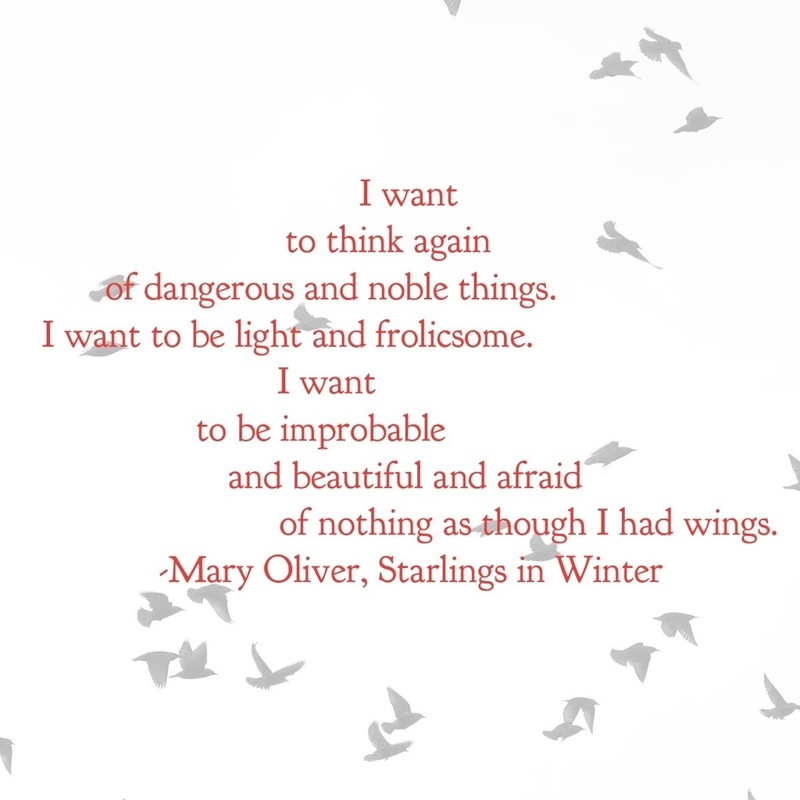 “Starlings in Winter” by Mary Oliver, from Owls and Other Fantasies: Poems and Essays. Beacon Press, 2003. Wow. Thanks for the Mary Oliver.